Special Jury award in Sierre for Le triangle rouge. 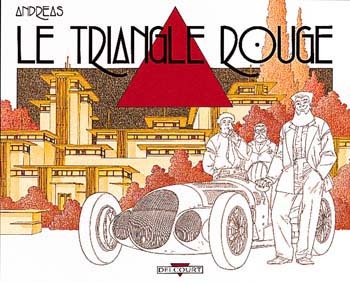 The album Le triangle rouge is an hommage to the American architect Frank Lloyd Wright (1867-1959). Architecture plays an important part in it. 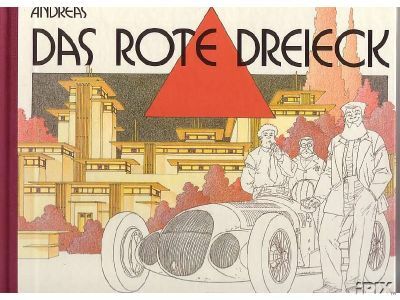 The book is filled with architectonic masterpieces, for which Andreas was inspired by the work of Lloyd Wright. He does want to say something about Frank Lloyd Wright. "For years I wanted to make a strip relating to his work. I admire him very much, since I was young, when I still wanted to become an architect. Mainly the forms with which this architect worked and the way he handled the division of space fascinate me. Like positioning windows at very odd places, they are too high; you can't look through them, yet a fine light is coming through it. The interiors of Lloyd Wright are special too, they contain so much power of the imagination, it touches me." "The forms and buildings he designed I used as a source of inspiration for my own drawings. Further I used his initials and his signature, a red square, in the story. For example, I play with all kinds of cubic forms. Further, I use as a reference to his signature a red triangle, a form that plays a central part in the book. The long format of the book, the yellowish paper, the light colors, all refer to Lloyd Wright's work. But for the remainder, it's my story I tell. Though I've never seen a house by FLW for real, I would like very much to live in one. They are not boring average houses, but living creations. I found it a great challenge to draw such buildings. The examples for these I took from books with pictures and drawings by FLW that I keep at my home. I don't like to copy, altered or not, from others. In this case I could agree with it, since it was my tribute to Frank Lloyd Wright." 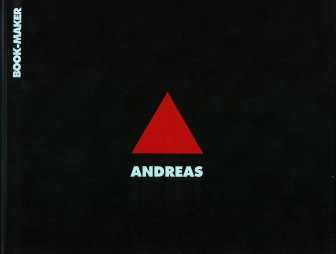 Andreas chose to do Le triangle rouge with crayons, something he had never done before. "I wanted this for a long time and I was pleased by it. Before I could start with the definite version I must have thought about the concept for two years. First it was going to be a detective novel, but later I got the idea of the Droste-effect. When I'm working I get ideas regularly. I saw, for example, when I started my story, different racing cars before me, I don't know why. It came from my subconscious. The story changed, but the cars stayed. The same goes for the pilot and the planes. Whether this can be associated with the Wright-brothers? Maybe so, maybe my subconscious has made a link between FLW and these aeroplane-pioneers (laughter)." "I consider Le triangle rouge to be a reaction to this second part of Cromwell Stone. Le triangle rouge has a more simple construction in comparison to the complicated story of Le retour de Cromwell Stone. Le triangle rouge is light, while Le retour de Cromwell Stone is dark, too dark actually." Despite all confusion an competition, the consumer has found its way to the Andreas-albums. 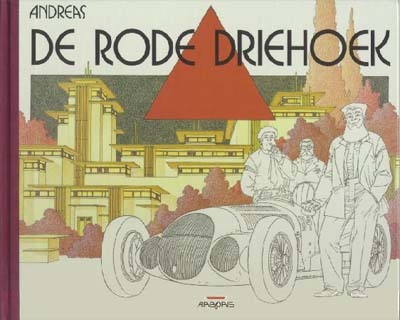 De rode driehoek (1995, Arboris), in a numbered edition of 1000 copies, is going well. Thanks to Peter Kuipers for the image.